All dogs should have unrestricted access to fresh, clean water at all times. The water should be topped up throughout the day and should be completely refreshed at least once a day. The water bowl should also be washed regularly – even if it doesn’t look dirty bacteria still builds up. Your Italian Greyhound should have its own feeding bowl. Many Italian Greyhound owners use raised feeding bowls which creates a more comfortable eating position for this long-legged breed. Stooping down to a bowl on the floor can lead to them gulping down air with their food which can cause tummy problems. Raised bowls are commonly available from pet stores – aim for one which is approximately 8″ off the ground, or simply place your Italian Greyhound’s bowl on top of a small box or container! Most Italian Greyhound owners feed their Italian Greyhounds twice a day – once in the morning and once in the early evening. Never exercise your dog immediately after feeding – always wait at least an hour before setting off on a walk after your Italian Greyhound has eaten. Most Italian Greyhounds are greedy guzzlers despite their skinny appearance! Like most dogs they enjoy treats but treats should be given occasionally as opposed to becoming part of the regular feeding routine throughout the day. If you are training your dog then it may be that they are receiving a large number of treats – make sure you deduct this as “food” from their normal food allowance. Italian Greyhounds are built to be lean and well-muscled. It is really important that you help your dog maintain a healthy weight – neither overly thin or obese. 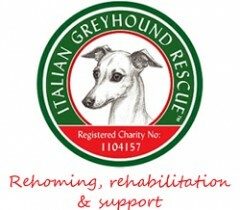 If your Italian Greyhound is very thin and you have problems getting them to eat, or if your dog is obese and needs to lose weight, contact your vet for advice as it is always worth checking whether or not there are any other health issues lurking.